Cookies again :)! Is there an easier way to fill cookies than just placing the filling on top? That’s why I like thumbprint cookies! Now, with so many thumbprint recipes out there, the classical ones seemed too boring to share, so I pepped up the classical version and voilà – vegan, gluten-free black and white shortbread thumbprints! The chocolate and vanilla shortbreads combine very well with the jam filling and make this the best tasting and looking thumbprint cookies I have ever made. Those were really melt-in-the-mouth shortbread thumbprints – although I guess this depends on the flour mix you use, as gluten-free all-purpose flour tend to vary in quality, depending on the brand. 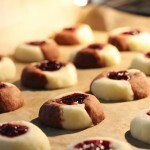 Traditionally thumbprints are filled with raspberry jam – either before or after baking the cookies. You may also try some other fillings like chocolate, toffee, nut butter or icing – whatever you like best! Heat oven to 320°F (160°C) and line a baking sheet with parchment paper. Beat sugar and margarine until creamy and stir in flour and vanilla extract. Divide dough in half and add cacao powder to one half. Cool doughs for about 30 minutes. Shape dough into balls - you can shape white and black balls separately, cut these into 4 pieces each and make a checkerboard pattern or make any pattern you wish. Place the balls on the prepared baking sheet, make an indentation in center of each with your thumb or a spoon. 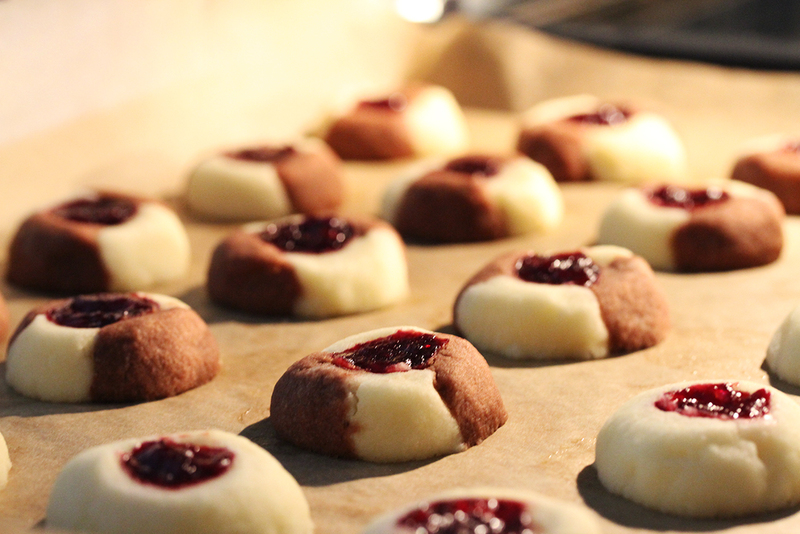 Fill centres of cookies with jam.